We all love the good ol’ kathi roll. What makes it so special? Is it the slight crunch of the hot parantha? The filling spilling over which has us grappling? Tearing up after battling too many chillies in a single bite? The rains are around the corner and we’re ready to flock down to our favorite roll spots! Here’s our list. Have you tried them all? Big and beautiful, that’s how we describe their special kebab rolls! Choose a kebab from the many displayed in their humble garage-kitchen. They’ll tuck in the tender pieces of meat in a paratha with green chutney, lime and red onions. We recommend the Kali Mirch Kebab Roll (INR 150) or go with something off their usual menu, a Chicken Dahi Roll (yes, it’s topped off with dahi) priced at INR 60 is delightful too! Love fusion food? You’ll go slightly bonkers when you taste the cheese and meat combination this roll station has been churning out. And it’s really reasonably priced – a Mutton Cheese Roll priced at INR 73 gives you the option of doubling up the meat, cheese or even add eggs! A Paneer Cheese Roll is priced at INR 62. They have sparse sitting arrangements – we recommend you pack up your order and devour it at home (although we’ve noticed people chomping down on the rolls in their cars!). They have two outlets in Sector 1 and 5. Here’s a sit-down roll stop if you need to catch your breath! They have super-affordable rolls starting at INR 30 for an Aloo Roll, a Chicken Roll costs INR 50 and if you’re feeling fancy, go with their delish Shami Kebab for INR 70 or the Special Tikka Roll for INR 90. A standard spot, we don’t forget the classics. Shiraz is an old timer and they serve all the good ol’ oldies! Veg rolls are for INR 45 while a Double Chicken is priced at INR 80. This is a takeaway outlet again so, hold off your hunger accordingly. It’s not on their menu but you say ‘roll’ and they give you one lipsmacking concoction. 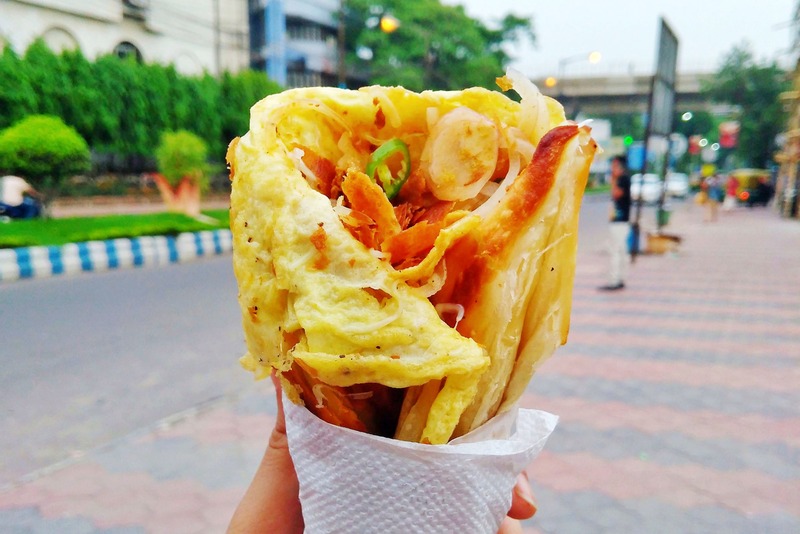 A chicken roll costs INR 55 – you can add some egg for INR 10. Here’s a bonus suggestion for all those who are health conscious yet dared to wade into this list! We always keep your kind in mind if not in our hearts (just kidding). Home delivered, full veg, and open till 3am, ALT has a super tasty tandoori paneer wrap for INR 139. The wrap base is a green colour which comes from the wholewheat and spinach combination. It’s healthy and good looking at the same time. Whatever your kink, we have a kathi roll suitable for you in Salt Lake.